Learning is Something to Treasure: Currently July!!! 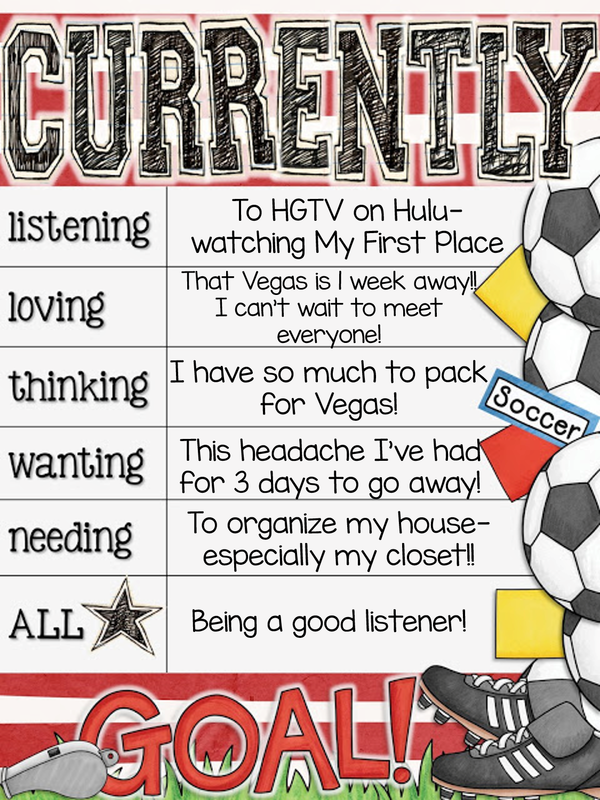 Today I'm linking up with Farley at Oh Boy 4th Grade for Currently!!! July is an insanely busy month for me...but in a GREAT way! I am going to meet a ton of my best bloggy buds in Vegas next week. This is definitely a new, exciting, and a bit of a nerve wracking experience for me. Will everybody like me? Will I get lost? Will I be sitting in a corner by myself? I've decided to go and just put myself out there. I am as down to earth and nice as they come, so why should I be nervous, right?...Right- I hope I can keep myself convinced of that. I'm listening to HGTV on Hulu right now. The hubs and I just took a leap of faith & decided to get rid of our cable TV. Our cable company raised our bill to $200 a month, so I said no way! We canceled our cable, upped our internet speed, and just have Netflix and Hulu. And you know what? I couldn't be happier about that. There is so much to choose from, so I have no regrets! I'm LOVING that TPT Vegas is exactly 1 week from today! OMG!!!! However, I need to pack, pack, pack and all of my outfits are currently being shipped in the mail. Here's hoping that they will be here in time! That's what I get for being a procrastinator. I'm wanting this headache to go away! This annoying headache that I've had for 3 days now! I suspect it's because I've been on my computer a lot lately for one reason or another. I think my brain needs a break! I NEED to desperately organize my house. We would love to sell our house soon, but being that our house is 17 years old, it's starting to show it's age. We have a lot of painting & cleaning up to do and quite honestly, I haven't been the most motivated lately since I'm trying to reap all of the benefits that summer break has to offer! My All STAR trait: I am a great listener. So what is going on in your life Currently? Link up with Farley and tell us about it! Were we separated at birth? My life soundtrack is HGTV, in fact on my Currently my listening was Househunters, "Where are They Now?" I absolutely LOVE my Roku--Netflix and Hulu are the absolute best....no commercials! Who needs cable? I am so jealous of all you guys going to Vegas! You are going to have so much fun!!! I get nagging headaches too sometimes--dose up on some Advil or Tylenol. Maybe you are just SUPER excited for your trip? And maybe watching all that HGTV will inspire you to get your house looking fabulous? Have an amazing time! Do you get migraines? Sometimes when I can't get my migraine to go away Excedrin and a coke do the trick. Hope to meet you in Vegas! I hope your headache goes away! I get migraines often and would not wish that kind of pain and discomfort on anyone! It's so awesome that you're going to Vegas, I hope to go next year! My All Star Trait was also listening, isn't that a great quality to have! 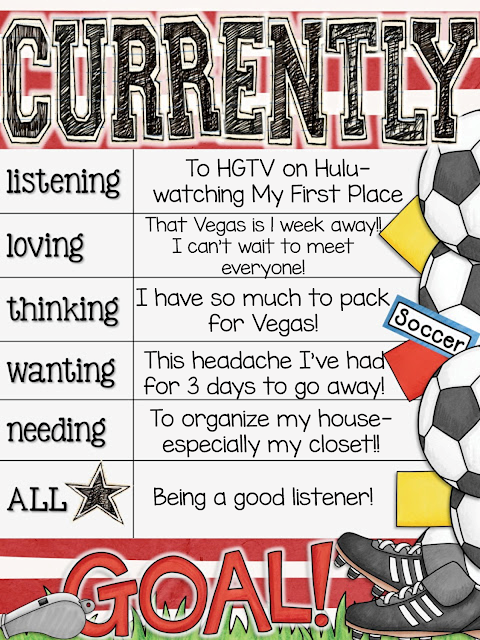 Thanks so much for sharing your Currently with us, I had a great time learning more about you! Your blog design is so cute, I LOVE your theme! I hope you have a great week!! I had a similar headache last week. It was lingering and would come and go. Ugh. Luckily (knocks on wood) I haven't gotten the dreaded summer cold! I said I was an All Star Listener, too! Can't wait to meet you! :) Hope you start feeling better!!!!!!!!!!! It's a Shark Week Blog Hop!! !